Choice A-Frame Marker Board Sidewalk Sign - Black Wood - 25" x 42"
Choice A-Frame Chalkboard Sidewalk Sign - Black Wood - 25" x 42"
Choice A-Frame Marker Board Sidewalk Sign - Black Wood - 20" x 34"
Choice A-Frame Chalkboard Sidewalk Sign - Black Wood - 20" x 34"
Choice A-Frame Marker Board Sidewalk Sign - Natural Oak Wood - 20" x 34"
Attract attention to your signs using the bright array of colors Aarco M-4 dry erase marker has to offer! 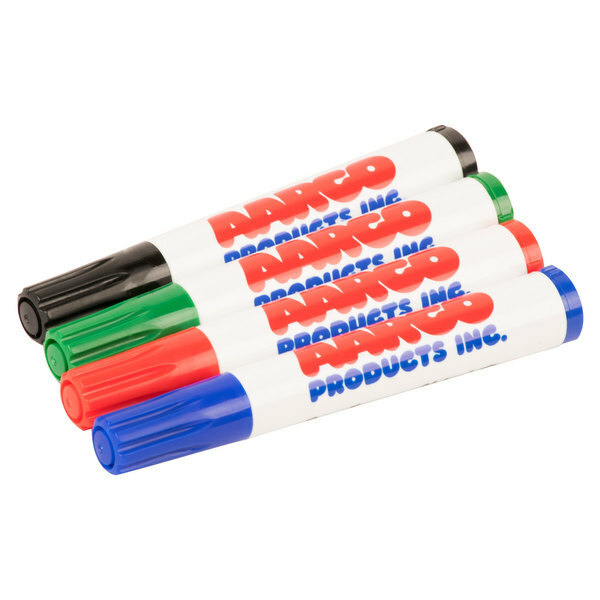 Each pack of dry erase markers come with one red, blue, green, and black marker, giving you the option to use different colors for various occasions. This marker is perfect for a variety of facilities including restaurants, schools, and hospitals. 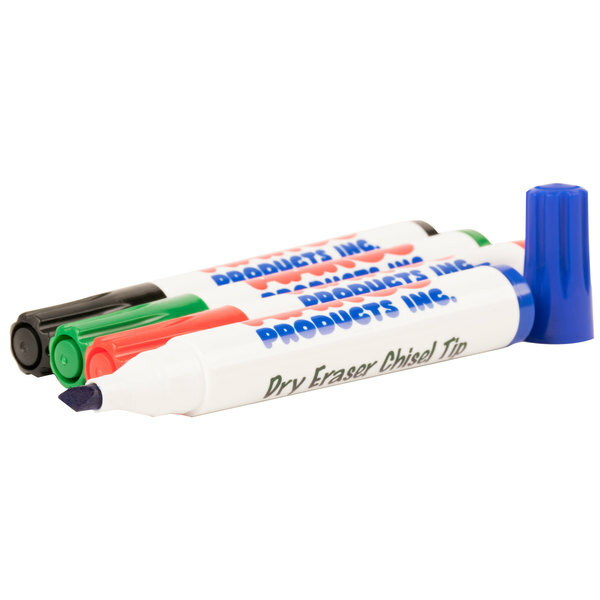 Try using these dry erase markers at restaurants or bars to announce feature drinks and upcoming events. You can also use it for the back-of-the-house to communicate to servers what the specials of the day are or what is out of stock. In a school or office setting, easily write on dry erase boards during classroom lectures or office meetings to add notes, key points, and graphics to ensure students and staff members are effectively absorbing the information you are providing. Each Aarco markers come with a chisel tip to allow you to vary the width of your strokes for both small and large writing surfaces. Create large bold text to announce dinner specials or create thin lines to allow more text on dry erase boards. The capped design also protects the tip from drying out when you are not using it. The marker easily wipes away with a compatible eraser, providing a simple way to fix mistakes or clear a board after you've finished a presentation. This marker is ideal for writing on A-frame menu and pedestal boards. You can also use these makers to write on tabletop signs and wall-mounted dry erase boards. These markers are very visible and allow the customer to view from afar. The options are endless by using different colors to advertise specials. Definitely recommend. This 4 pack of markers comes in 4 different colors; black, green, red, and blue. they are for use on dry erase boards and will wipe away with an eraser or cloth. These dry erase markers work great and do not die quickly. Great price as well and we will be purchasing them again in the near future!! Great product, used for months and still going. bright colors and easy to erase. Would recommend for indoor or outdoor use on dry erase boards. Work like a charm. No issues thus far, like any other dry erase markers you would expect. Erases readily as well even if some time has passed. Can't beat the price! great smooth lines on white board good bold colors, make sure to put the caps on firmly as they can be left open slightly without noticing it right away. thy do have a chemical smell but not as strong as some other dry erase! 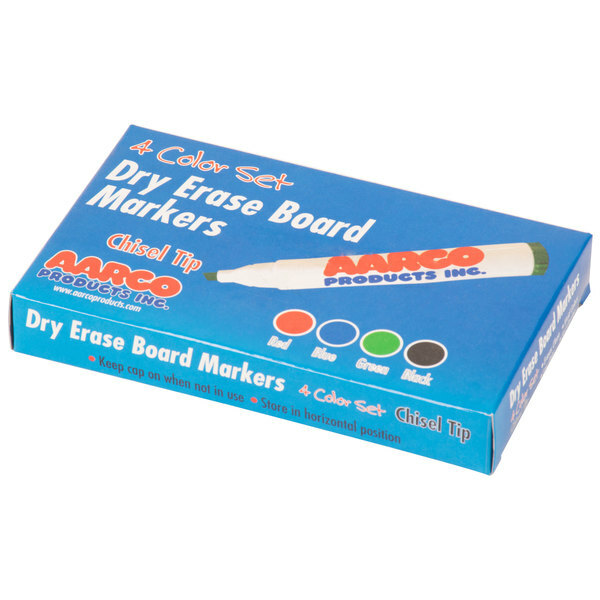 These are inexpensive colorful dry erase markers by Aarco. They certainly do the job. A must have if you have a dry board. 4 stars! These Armco dry erase markers work great on our dry erase calendar at home. The colors are bright and show up great, and they are easy to write with. 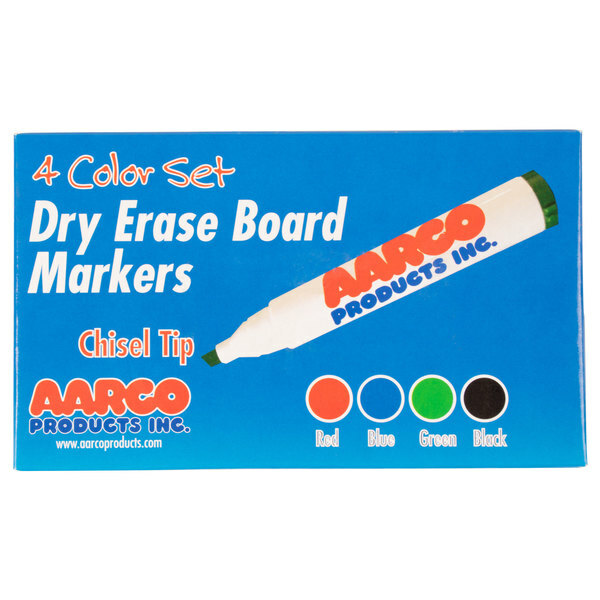 The Aarco dry erase markers are a great substitute for other "big name" and more expensive markers. The standard colors all show up differently and meet all the needs we have on our kitchen dry erase boards. The markers give a bright color to the white board's ground. The package of four markers is economical and one can design your board for presentations. Sir Clean Miami used Aarco Dry Erase Markers for the high contrast in the blackboard, you can choose between different vivid colors, We recommend these markers for the reduced the odor marker. These dry erase markers work great for our dry erase board. They work on a white board, or on a glass board. They don't cause any pesky streaking. What can I say? This is a pack of your standard color dry erase markers. I have a feeling these won't last as long as more expensive markers, but I wouldn't mind buying these again. They work perfectly fine. We use them to write on the stainless steel fridge in the kitchen to remember what we need to order, and they do a good job. I am sure they would as well on a white board. Decent set of markers. They get the job done and are cheap. I appreciate being able to order them on here rather than making an extra trip. These markers served their purpose, but did dry out fairly quickly. We used the dry erase markers for laminated checklists for opening and closing the business each day. Very good quality product. This can be used for writing menu boards or daily specials in restaurants and bars. Good price. I like these markers. These Dry Erase Markers work just as well as the higher priced ones. They last a fair amount of time and always wipe off easily. An essential in any classroom or kitchen. It is easy to label items and erase the label if reusing any bins, carts, or writing notes. A price worth paying for a pack of markers that come with different colors (red, black, green and blue). The ink last for a long time. This is a valuable pack of dry erase markers! Nice for any white board! Very bold colors are easy to read, even from a distance!! !